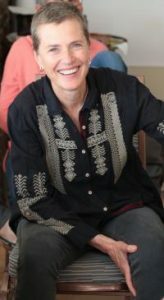 Join Diane Musho Hamilton Roshi for a Women’s Retreat in Torrey, Utah over the Valentine’s Day weekend, February 13-17. Come to Torrey to experience the strong forms, rich ritual, and deep silence that have been refined through centuries of Zen practice. All female-identified practitioners are welcome. Experience the integration of interpersonal inquiry with traditional forms of Zen practice. Full days include zazen, walking meditation, work practice (samu), meals together, and Dharma Talks. Ask questions and receive personal guidance for your practice in interview with Musho Roshi (Dokusan). Enjoy invigorating embodiment practice and group outings in nature. Let yourself be awed by the winter beauty of the red-rock country of Southern Utah. Delicious chef-prepared meals, beverages, and snacks are included, Wednesday dinner through Sunday breakfast. The Women’s Retreat begins with dinner at 6:00 pm on Wednesday, February 13 and ends at noon on Sunday, February 17. Three full days of sitting meditation and quiet (Thursday, Friday, and Saturday) will support your inquiry and provide a container for reflection, renewal, and recommitment. This intimate gathering is limited to 24 participants. Registration includes meals. Lodging is booked separately. Two Arrows Zen members may request work-trade for partial tuition remission by offering service to the community in exchange for extra work assignments. Work-trade includes extra work shifts during the retreat and arrival by noon on Wednesday, February 13 to assist with preparations, and late departure on Sunday, February 17 to help with closing the facilities. Email to request a work-trade agreement. CONTACT US. Please be certain that your intention and commitment to attend is clear when you register for any Two Arrows Zen program or retreat. Space is limited in all our programs and we need enough lead time to fill an open space if you cancel your registration. POLICY Program fees are refundable until December 30, 2018, less a $75 administrative fee. After that date, there are no refunds for any reason unless your space fills from a waitlist. In that case your program fee will be refunded, less the admin fee. (The maximum enrollment for this retreat is 24 participants.) In case of cancellation because of emergency or illness within 5 days of the retreat start date, Two Arrows Zen members may request a rollover 50% of all program fees on account to another program or retreat registration within 12 months. After 12 months, all funds retained will be added to the scholarship fund. Sangha House lodging reservations are refundable if your space is filled. Torrey is 215 miles from Salt Lake City which is the nearest airport. Plan for 4 hours of travel time from SLC to Torrey. Everyone is responsible for their own transportation. We will put registrants in touch with each other to facilitate ride shares. The retreat officially opens with dinner on Wednesday at 6:00 pm. All monks, work-trade registrants, staff, and those in service positions (ino, doan, mukugyo, jishas) are asked to arrive by noon for lunch followed by a work and service practice period. See below for the retreat schedule on opening day and through the week. Please plan your travel to depart after 12:00 pm on Sunday. Two Arrows Zen maintains a beautiful Sangha House in Torrey, a short drive from the Zendo. Shared dormitory-style lodging is $35/night. There is one room with queen bed and full bedding for $55/night. 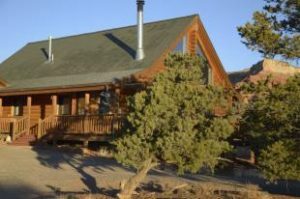 Located in the Sleeping Rainbow area just north of Torrey, you will enjoy an exquisite view of the red rock cliffs and a comfortable, spacious living space, including a fully equipped kitchen and two full baths with tubs. Sheets, towels, and Internet service are included. The Sangha House is located about 3 miles from the Zendo and is a lovely bike ride, a 30-minute walk, or a 5-minute drive. Sandcreek RV & Camp (Leslie & Harry Eubanks) cabins will be open during this retreat. The Torrey Trading Post Cabins are a five-minute walk to the Zendo. Call directly to make reservations. Cabins with two full-size beds are $50. Shared bathhouse. Other local hotels and cabins are open for reservations in the off-season. Check Trip Advisor or similar travel sites for information and recommendations. AirBnB and VRBO are also good sources for winter lodging in Torrey and nearby locations in Wayne County. 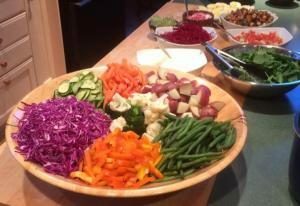 You will enjoy three healthy and nutritious meals a day during the retreat. Meals are largely vegetarian, with some other protein options at lunch. Main courses are mostly vegetarian with other protein options available at lunch. Everyone is served the same meal. If you have medically necessary dietary restrictions, such as strictly gluten-free or lactose-free, we ask that you bring your own food to supplement. Gluten-free cereals will be available at breakfast as will a limited supply of other gluten-free items at other meals. A medically diagnosed allergy to seafood or nuts requires that you inform us, and maintain your own rescue medication, such as an epi-pen. We regret we are not able to prepare special meals for individuals or provide refrigerated food storage in the kitchen. One of the commitments of our practice is that everyone with a sincere desire and the ability to practice is welcome, and no one is excluded on the basis of financial resources. We practice in order to grow in generously receiving and generously giving. Please consider making a donation in any amount when you register to help support our scholarship practitioners attending The New Year Retreat. All contributions will be applied directly to support all categories of participation, and to encourage diversity in our community of practice.